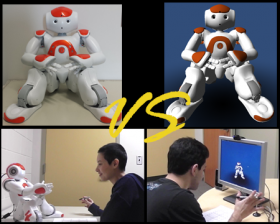 In designing and evaluating human-robot interactions and interfaces, researchers often use simulated robots because of the high cost of physical robots and time required to program them. However, it is important to consider how interaction with a simulated robot differs from a real robot; that is, do simulated robots provide authentic interaction? We contribute to a growing body of work that explores this question and maps out simulated-versus-real differences, by explicitly investigating empathy: how people empathize with a physical or simulated robot when something bad happens to it. Empathy is particularly relevant to social human-robot interaction (HRI) and is integral to, e.g., companion and care robots. To explore our question, we develop a convincing HRI scenario that induces people’s empathy toward a robot, and explore psychology work for an empathy-measuring instrument. To formally evaluate our scenario and the empathy-measuring instrument in HRI scenario, we conduct a comparative user study: in one condition, participants have the scenario which induces empathy, and for the other condition, we remove any empathy inducing activities of the robot. With the validated scenario and empathy measuring instrument, we conduct another user study to explore the difference between a real and a simulated robot in terms of people’s empathic response. Our results suggest that people empathize more with a physical robot than a simulated one, a finding that has important implications on the generalizability and applicability of simulated HRI work. As part of our exploration, we additionally present an original and reproducible HRI experimental design to induce empathy toward robots, and experimentally validated an empathy-measuring instrument from psychology for use with HRI. Stela H. Seo. A simulated robot versus a real robot: an exploration of how robot embodiment impacts people's empathic responses. M.Sc. Thesis (2015). University of Manitoba, Canada.